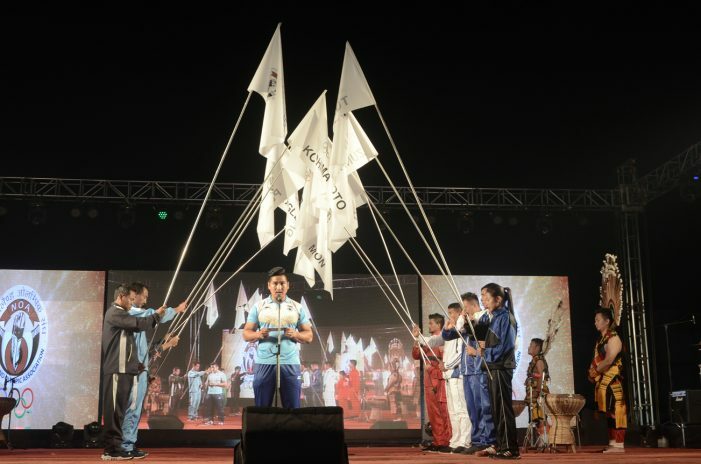 The opening ceremony of first Nagaland Olympics was held at a glittering programme showcasing the talents of Naga youths at Dimapur District Sports Complex (DDSC) Tuesday evening. The grand opening was witnessed by hundreds of sports enthusiasts. Nagaland Governor P B Acharya declared open the first ever sporting event in the State at a glittering opening ceremony, calling it a historic moment. He said Nagas are second to none. Lok Sabha MP Neiphiu Rio was also present on the occasion. The four-day event will be held at three different venues here where over 1,200 athletes from 11 districts of the State will participate in various disciplines including wushu, wrestling, volleyball, taekwondo, table tennis, lawn tennis, football, badminton, boxing, archery, athletics and sepaktakraw. The event being organized by Nagaland Olympic Association and sponsored by the Government of Nagaland will culminate on December 16. Performances by renowned bands of Nagaland Lords of Rock, Epicon, Tetsoe Sisters and Maple Tree School students, Naga Folklore Group, Akhrole Keyho, Ethnic Future, Faith in Action and other various artistes enthralled the sports lovers during the ceremony. Events in each discipline are being conducted by the respective affiliated state sports associations under the supervision of the technical committee of the games. Earlier, the Deputy Commissioners of the districts, who are also the chairmen of the District Sports Councils, were entrusted with the responsibility of the respective district contingents. The organizing committee of the games had earlier sanctioned a preparatory grant to each district for preparation of the district contingent. The amount was meant for selection, training, uniforms, kits and travel arrangements to and from the event. Each district contingent include a chef-de-mission, contingent team manager, deputy contingent team manager, team manager and coaches of each discipline. The organizing committee is providing accommodation, food and local transport for the contingents at Dimapur. Participants have been directed to bring their own playing kits and team uniforms, including respective bedding and mosquito nets.